User acces permission : diagram, originally uploaded by activeside. 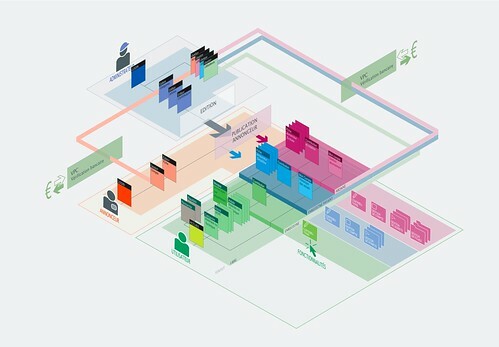 Nice looking example of Information Architecture illustration design to explain the process of publishing, registration process, and access permissions. XHTML 2 + HTML 5 = Better Combination? Just read Mike Malone’s nicely written article about differences between of current XHTML2 and HTML5 standard development drafts. There are certainly some details that article about main differences don’t include but as an overview it’s good. As for the features in those specifications, I’m not sure which of them will get more support in the end. It feels for some odd reason like mix of two standards could be the best for most people (if it would be done in good way). XHTML2 has probably simpler basic syntax and several new things in it make coding faster and cleaner. While I’m not sure about now larger parts like XForms could make things somewhat more difficult it seems that overall approach of things is to better way. One of the things I like most in XHTML2 is ability to create link from any element by adding href attribute to it. It also looks like making of navigation lists has been defined in much better way because it’s simpler and cleaner than what HTML5 offers for that issue. HTML5 has many good ideas but for some reason it feels like they are not making it as good it could be. They have introduced many new elements to standard but good question is if those additions are enough in longer timeframe. XHTML2 has more modular way of thinking that allows to add more features in parts instead of having to define everything in one big specification. Also it seems to be bad thing that HTML5 still supports writing of markup in way based of old HTML standards, because it could allow people to do more mistakes in syntax if they get used to writing in bad way (or think they can do stuff in the same way as in HTML4). As what goes to big additions in HTML5 to improve making of web-based applications I’m quite pleased that things are really going be better. New API’s help to make web more integrated to desktop software but developers of browsers need to make sure that security of users is taken care of because new ways of doing things present dangers for new types of malware. While API that exposes the browser history (allowing applications to add to it so they don’t break the back button) is good thing to add it has to be done in way that it don’t allow website to get all information of browser history. Also network API makes it possible that some web-based software could use it to make bad things. While it’s still quite good addition for many things, security side of things needs to be planned well (but that is more likely problem of browser developers than people planning standards). But is one of those two standards going to rule the world or is there room for both? Mayby. Or could it be better if more fluent way of developing web-based applications (as in HTML5) would be integrated to somewhat more clean way of XHTML2? Whould that create one standard with best set of features that would still have simple basic syntax? Or do we need to make all more advanced features as extensions to language if keeping of basic set of features is what people need? Anyways, my understanding of specifications is still quite limited so my current opinions about them could be wrong but just wanted to share what thoughts I had about them. If something I wrote didn’t make sense, it would be nice to hear what you think about subject.